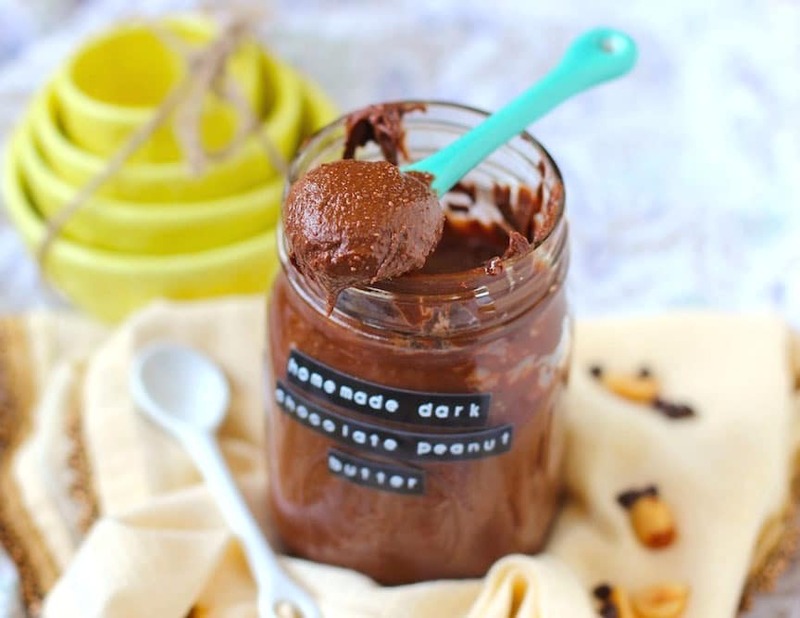 Chocolate + Peanut Butter + Food Processor = Homemade Dark Chocolate Peanut Butter! After Christmas 2012, my friend flew from Arizona to visit me and travel around New York City. Before we watched the ball drop on New Year’s Eve, we stopped by the Peanut Butter & Co. sandwich shop. We just had to, both being PB-lovers and all. They didn’t have any gluten free bread so I couldn’t get a sandwich, but that didn’t stop me from buying seven a couple packets of their peanut butter flavors! I tried the Bee’s Knees first. I think it goes without saying that it was delicious. Then I tried the Dark Chocolate Dreams. And it goes without saying that I was addicted. From January to April I was buying the individual packets of the Dark Chocolate Dreams on a weekly basis, every time saying, “this will be my last one!” HAH. Peanut butter and sugar will do that to you. Ever since my first taste of the stuff I have made it my goal to make an exact replica, just without the refined sugar and palm oil. It took a while to get the recipe right but I finally did it. 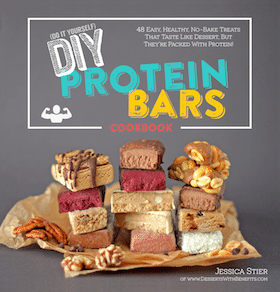 I healthified the Peanut Butter & Co recipe so you can make a jar for yourself at home! You know where the ingredients are coming from and you can even double (or even triple) the recipe if you want to jar some up and give a couple away as gifts! Or just keep them for yourself. Psst, trust me, you’ll want to hoard this! In a large bowl, stir together all of the ingredients. 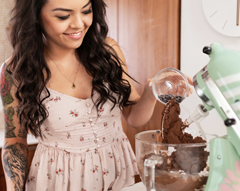 You can also blend everything together in a food processor for an ultra smooth and creamy nut butter! Give it a taste and add more sweetener or a pinch of salt if you like. Scoop mixture into a jar, seal tightly, and store in a cool/dark place. 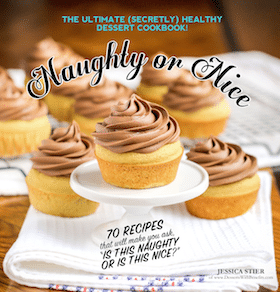 **You can use No-Sugar-Added Chocolate for a sugar-free/low-carb/keto version! 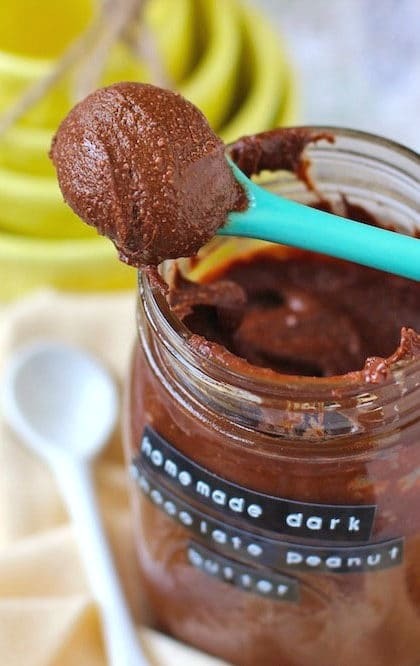 Compared to Peanut Butter & Co.’s Dark Chocolate Dreams spread, my recipe is lower in carbs and sugar (plus has an option for sugar-free, if you’re avoiding sugar)! You can eat this at any time without having to worry about a sugar rush. PB&Co has nearly 2 teaspoons of sugar in just 2 tablespoons of peanut butter! I’d choose healthy fats over excess sugar any day. 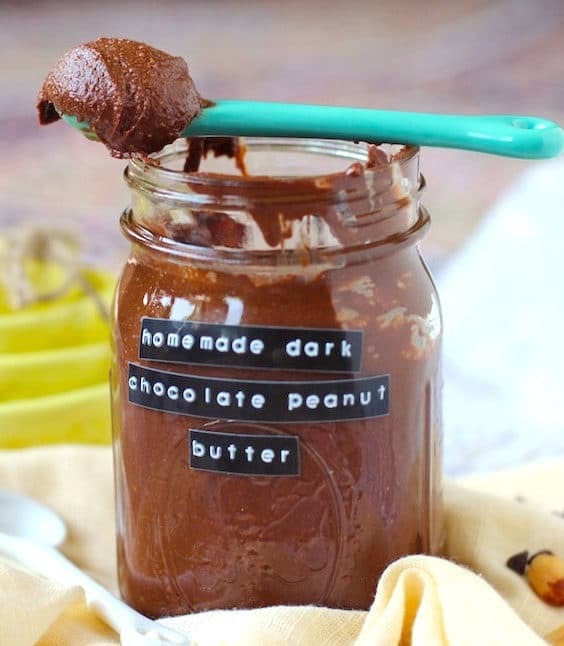 One spoonful of this Homemade Dark Chocolate Peanut Butter and your mouth is in for a real intense foodgasm. Now THAT looks like heaven doesn’t it? It sure looks like frosting, I mean, a healthy snack to me! Ooh, this looks like this will be next Nutella! 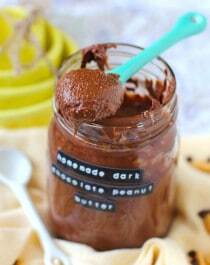 I love peanut butter and chocolate together and this would be delicious on everything!! Peanut butter, or any nut butter really, is so much better than frosting, especially when chocolate is in the mix! I’m such a fan of chocolate and peanut butter (and totally don’t understand how anyone doesn’t love this flavor combination). You’re photos are just beautiful, too!